Samsung’s top home theatre system is, for the asking price, a huge step up from the speakers inside your TV. It’s great for surround-sound Blu-rays, and the Smart Hub can liven up an otherwise dumb television. You’ll get better sound from a proper home theatre, though, and the speakers are a little plasticky. Samsung’s best home-theatre-in-a-box is a smart way to boost the volume, sound quality and power of your TV’s sound system, and it’s versatile even if it won’t compare to a proper home cinema system. If you’ve just bought a new TV, chances are you’re a little less than impressed with its sound quality. The super-thin TVs we’re used to just don’t have enough room for big speakers. Samsung’s Series 9 home theatre system is a 5.1-channel surround sound setup, consisting of four tall floor-standing speakers, a horizontal centre channel speaker, a squat and boxy subwoofer, a combined receiver/amplifier/Blu-ray player, and a wireless audio receiver for the rear floor-standers. It’s quite attractive for a relatively cheap home theatre system, with a brushed metallic finish on the speakers’ plastic body and an occasional hint of chrome. The speakers themselves feel quite cheap and a little flimsy, though — you can tell where costs have been cut to keep the Series 9 under $1500. The receiver/amplifier is, like the speakers, a good-looking piece of technology. A circular cut-out on the top right of the amp shows off Samsung’s valve pre-amplifier — supposedly lending a warmer and richer sound to the system, although the vast majority of the 1330 Watt’s gallium nitride amping power is cold, clear, calculated and digital. Since it’s a home theatre in a box, the Series 9 requires a fair bit of setup. Set aside around an hour to get everything put together and placed where you want it. Each speaker comes in three pieces — base, stand and tower — and requires a bit of screwdriver work to assemble, with the stand and tower connected by a single Phillips screw and the base held to the stand with three Phillips screws. The small, horizontal centre speaker doesn’t require assembly. The stand component of each tall-boy speaker has a non-detachable length of speaker wire running from it, which you’ll have to thread through the base, around your room, and to the back of Samsung’s receiver/amplifier for the Series 9 system. 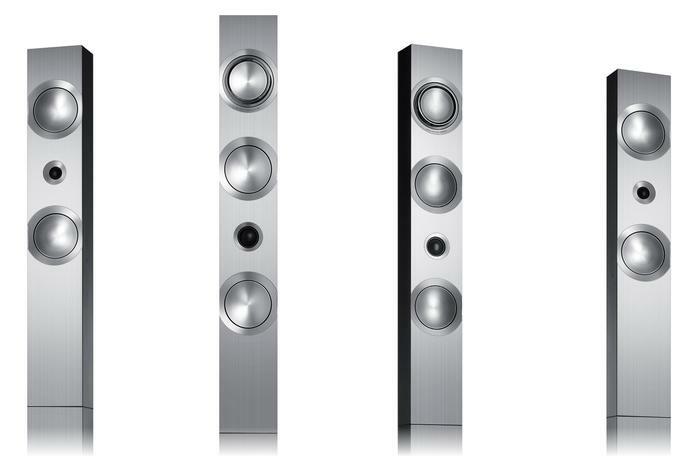 The two front speakers of the Series 9 are taller than the two rears, with a swivelling tweeter up the top that can be adjusted horizontally and vertically off-axis. This is a useful feature to fine-tune the sound of the home theatre system; it’s minor, but it does come in handy if you’ve got the speakers set up in unconventional or off-centre locations. Samsung has included a dual-core processor in the receiver, powering the Series 9’s four-pane Smart Hub, which lets users download the full range of Samsung’s apps for catch-up TV, video on demand, games, social networking, and so on. The experience is largely similar to using one of Samsung’s Series 8 LED or plasma TVs — there’s a hell of a lot of content on offer, and the Series 9 is quick with slick-looking menus that are smartly laid out. If you want to use the home theatre system for more traditional uses, the Series 9 is able to fulfil all the standard requirements of any good media player — it’ll play any Region B (Australia, UK) Blu-ray movies, DVDs, or any of a huge variety of media files through its front USB port. We tried AVI, MKV, DIVX and AVCHD video files with no problems. And, of course, like any other home theatre system worth its salt, the latest and greatest high-definiton audio codecs — we’re talking DTS-HD Master Audio, and Dolby TrueHD — are supported. The most important aspect of any home theatre system is the sound of the speakers, and we’d give Samsung a qualified pass in this area. The Series 9 sounds worlds better than any TV’s internal speakers, by virtue of the Series 9’s larger size, massive power advantage and physical surround sound setup. If you’re playing a Blu-ray movie with a good surround track, the rear speakers of the HT-F9750W do more than their fair share of work and make positional audio sound great. There’s good levels of detail from the Series 9’s tweeters, especially when adjusted to cater to the best possible listening position. We think the centre channel speaker is slightly underpowered for surround movie dialogue, but this can be remedied almost entirely through a bit of tweaking in the receiver/amplifier’s menus. The tall-boy speakers suffer a little from a lack of mid-range power, because of their thin dimensions and plasticky construction, but the overall sound is pleasant and appropriate for movie-watching (although not so much for music). The subwoofer does a simultaneously good and mediocre job. Mid-bass notes, where the speaker plays relatively high frequencies (for a subwoofer) to pad out the mid-range-less sound of the floor-standing speakers, are loud, clear, and powerful. Lower bass is somewhat lacking, though, making the Series 9 feel slightly less impressive at full power — where you’d normally expect some floor-shaking bass. Samsung’s Series 9 home theatre system does a good job for the price, and would make a suitably impressive upgrade to any slim-and-trim television. The Smart Hub is invaluable, and the speakers sound good for their size and purpose.